Finding affordable safety boots is not always easy and you will need to put some effort into having the right pair of boots. When it comes to a soft toe boot, most people look for some of the more common brands, but these can be rather expensive as well. Ever Boots are one of the smaller brands and while they still have great quality boots, they are much more affordable. Finding a pair of these boots did not prove to be too difficult and once I found a decent pair, the challenge was to see how far I could push them and get the best possible results. 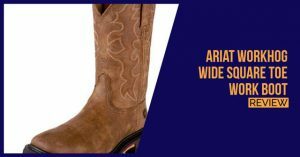 These boots were fairly good under pressure and they certainly have that edge to them that will make them a great buy and draw in customers looking for something more affordable. Read on to find out if these are the ideal boots for you! Made from leather materials, these boots tend to look great and they hold up when placed under pressure. The leather has been tanned and this will keep it from drying out and cracking, but you may also apply more of this solution if you want to extend the longevity of the leather materials. For the outer sole, you have lug rubber and this thick lug is not only comfortable but durable as well. After testing the boots, it turns out that the outer sole is slip resistant as well. The loop system for the laces is also quite efficient and should enable you to tie up the shoes comfortably to the best of your ability. 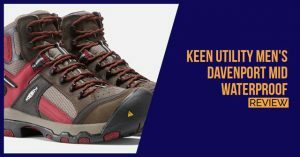 This tighter fit is much needed since the boot does run somewhat larger than some of the others on the market, but this makes it ideal for those with wider feet as well. The inner sole is not the best of quality and PU cushioning has been used. Unfortunately, this does not really mold to the shape of your feet and many people have found it to be a little uncomfortable as well. Fortunately, this inner sole can be removed if needed and we do recommend that you consider replacing it with EVA or memory foam. EVA is the more affordable of the two and should offer you that molding ability when you need absolute comfort. These boots might not have much in terms of additional features and they have something called Goodyear welt construction. This has been designed to offer you maximum comfort and to make the shoes a little more ergonomic in terms of the overall fit. On the inside of the boot, you will also be treated to an inner lining that is not only comfortable but also abrasion resistant. This could help minimize the break-in period as well. After receiving a pair of these boots, I found myself ready and extremely excited to try them on and see what they are made of. 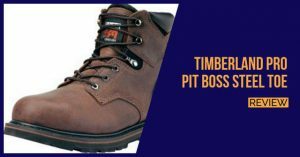 The first thing that caught my eye is the fact that the boots do not have a steel or protective toe included and with the safety standards of today, this is something that you might really need. The fit was rather big as well and you should know that these shoes are designed for those with larger feet. The boots are somewhat wider and the sizing is a little big. If you have smaller feet, it is worth looking at half a size smaller if you are looking for the best overall fit from these boots. The outer sole is definitely durable, as well as the leather upper and this should give you the best possible value for your money. One problem that I had with these boots is the inner sole and while I do not suffer from any real foot problems, this PU cushioning might not be the best if you have some problems. While adding an EVA sole is a little more expensive, it is definitely something you need to look into if you want the best possible results and value for your money. Fortunately, the original inner sole can be removed and replaced if needed. If you have a slippery surface you need to deal with at work, this boot could become your best friend. While it might not be ideal for ice, the boot certainly holds up when you deal with oil and water. It will keep you from falling and slipping when carrying heavy objects in daunting and volatile areas. Unfortunately, the boot does not have any other really impressive features like being resistant to electrical shocks and waterproof. The boots are extremely affordable as we have mentioned. The larger sizing is perfect for individuals with flat or wider feet and should provide you with a less constricted feeling. They also have excellent durability and if you keep the leather tanned and protected, these boots should last you a couple of years. The boots will not really have such a tough break in period and you could easily find comfort in them within a couple of days. The outer sole provides some excellent grip and those working in volatile environments should find the shoes extremely well designed. These boots lack a decent inner sole and this could cause some problems if you are suffering from foot problems. The boots also lack ventilation and this could cause your feet to really heat up on the inside. After testing the boots, they are not waterproof and you will need to avoid heavy water puddles. Quality is something we all want and these boots do provide some quality, but not a lot in terms of diversity. 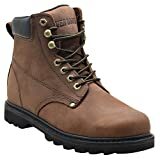 If you are looking for an affordable boot to get the job done for a while, these should be the perfect work boots to help you do this. With so many boots on the market, it can be hard to recommend this as one of the best, but it certainly is a great affordable option to consider. We would like to thank you for reading this article and we would like to encourage you to share your thoughts on these boots. Please let us know in the comment section if you have ever used them.